As LEDs become a more popular and energy-efficient alternative to traditional incandescent and fluorescent lighting, a great deal of attention has been drawn to the question of connections between lighting and health effects. Preliminary research indicates that effects like flicker and high blue light content may impact focus, sleep and general health, and other theories suggest that spectrally tuned light sources could be used to enhance environments for specific uses. There is still much to be learned about how lighting intensity, consistency and color balance affect the human body and mind. Research in this area will continue to hinge on carefully designed experiments to quantify physiological responses and impact. Accurate measurements of spectral output and intensity of the light sources under test will play a large role in these studies, and Ocean Optics offers a full suite of products capable of quick and easy characterization of sources in the lab and field. Lighting being run on 100 or 120 Hz AC power often shows fluctuations in intensity at the same frequency. Fluorescent lighting is particularly prone, with variations of up to 20%. While the eye tends not to register intensity fluctuations below 70 Hz, frequencies of up to 200 Hz can lead to eye strain and headaches for some, and poorer performance on visual tasks in others. Unfortunately, many schools and office environments that demand a high level of focus and productivity use lights prone to flicker, making this an issue of general concern. One of the challenges in studying the physiological impact of flicker has been the lack of instrumentation capable of characterizing light sources on the time scale of the flicker. The new Ocean FX™ spectrometer not only allows radiometric measurements at up to 4,500 scans per second using a sensitive CMOS detector, it also provides full spectral scans of wavelength ranges up to 200-1100 nm. This allows flicker characteristics such as frequency, amplitude and chromatic variation to be investigated relative to physiological response. In fact, we recently demonstrated the ability of the Ocean FX to show the spectroradiometric evolution of several light sources over time, including fluorescent lighting, a smart phone flash, white LED home lighting and a home halogen light. In doing so, we learned that the spectral output can vary during the power cycle for some light sources, while for others it remained very consistent. See the full study here. Though no guidelines have yet been established to limit flicker in LED-based products, it is well known that solid state lighting is not immune to flicker, generating some concern in this growing industry. Accurate, high speed measurement systems like the Ocean FX are sure to assist both in research into the effects of flicker, and in enforcement of guidelines that may be established as a result. Blue light is known to interrupt our natural circadian rhythms by triggering the melanopsin receptors in our eyes to produce melatonin, thus interfering with the natural response our bodies have developed to set our sleep and waking cycle. Blue light is emitted from computer screens, TVs, smart phones and tablets, prompting recommendations to minimize electronics use for an hour prior to sleep. It is also present in greater proportions in white light LED sources than in white light incandescent sources. This is because blue LEDs are often used to stimulate the phosphor that gives the appearance of a “white” light to the eye. As the eye can find it difficult to distinguish a white light source with a high blue spectral component from one that does not, it is important to have accurate spectroradiometric measurements for their characterization. This allows light sources and electronics from different manufacturers to be evaluated for their blue light component, and facilitates testing of screen-dimming apps, screen shields or filters to ensure they are performing as advertised. Ocean Optics offers a range of affordable spectrometers capable of measuring the blue light component from light sources and emissive displays, including the very compact, low-cost STS-RAD. While CCT (correlated color temperature) can be a good way to gauge the blue light in a typical blackbody source, opinions in the industry are still divided on whether it is appropriate for LED sources with two or more spectrally separated maxima. In a previous application note, we put the FLAME-S-RAD to the test to measure a variety of backlit LCD and LED displays for their blue light emission, each with different dimensions and screen resolution performance. OceanView software made it simple to integrate the total amount of blue light being emitted in the fatigue range (400-420 nm), macular damage range (400-440 nm), and sleep disruption range (460-484 nm). See the application note. One of the most interesting ideas to arise from the proliferation of LED lighting is the potential for human-centric lighting (HCL) to enhance well-being or productivity. This involves optimizing the color temperature or color balance of the light source for the environment or application in which it will be used. 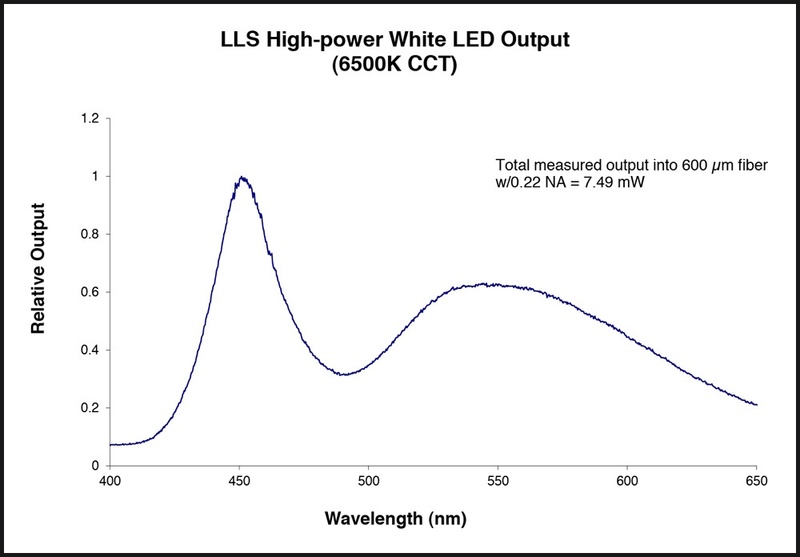 This can be achieved using tunable solid state lighting that offers white light at color temperatures from as little as 1650 K to as high as 8000 K. Tunable sources are now available from a variety of LED vendors, who mix and match up to five LEDs to produce the full range of color temperatures. Many early studies and research from providers of tunable lighting claim benefits to HCL like increases in student productivity, accelerated healing, and elimination of jet lag on international flights. Intuitively, the potential for light to affect mood, focus and general health is great, but experiments in this area can be difficult to perform accurately. Many other pre-existing factors can influence the outcome, and the biochemistry involved in light perception and effects is incredibly complex. Research is just beginning to scratch the surface of this fascinating but challenging field, and will require accurate color temperature, irradiance and spectral measurements of the light source intensity to do so. Ocean Optics’ modular solutions offer the flexibility for researchers to design a measurement system that is specific to the needs of their study. Learn more about irradiance and design your own system! Accurate spectral, CCT and irradiance measurements from Ocean Optics systems benefit researchers undertaking studies into the health impact of lighting, as well as the ability of manufacturers to uphold standards and guidelines that are established as a result of that work. As the LED light source market continues to grow and develop products for specific lighting applications, Ocean Optics tools will be there to both set standards and determine compliance. Contact us today to discuss your application.